Intestinal ischemia/reperfusion injury (IR) is characterized by intermittent loss of perfusion to the gut, resulting in dramatic increases in morbidity and mortality. Based on previous studies indicating an anti-inflammatory role for hypoxia-inducible factor (HIF)-1–elicited enhancement of extracellular adenosine production via ecto-5′-nucleotidase (CD73) and signaling through the A2B adenosine receptor (A2BAR), we targeted HIF-1 during IR using pharmacological or genetic approaches. Initial studies with pharmacological HIF activation indicated attenuation of intestinal injury with dimethyloxallyl glycine (DMOG) treatment during murine IR. Although DMOG treatment was associated with induction of CD73 transcript and protein, DMOG protection was abolished in cd73−/− mice. Similarly, DMOG treatment enhanced A2BAR transcript and protein levels, whereas DMOG protection was abolished in A2BAR−/− mice. Finally, studies of mice with conditional HIF-1α deletion in intestinal epithelia or pharmacological inhibition of HIF-1 with 17-(dimethylaminoethylamino)-17-demethoxygeldanamycin revealed enhanced tissue injury during IR. These studies indicated a tissue-protective role of HIF-dependent enhancement of intestinal adenosine generation and signaling during intestinal IR. Acute mesenteric ischemia is caused by a critical reduction in intestinal blood flow that frequently results in bowel necrosis and is associated with a high mortality (1). Intestinal ischemia/reperfusion (IR) is encountered in a variety of clinical conditions, such as hemorrhagic shock, strangulation-obstruction of the intestine, sepsis, vascular surgery, small bowel transplantation, cardiopulmonary bypass, or abdominal aortic surgery (2). IR of the intestine can result in a systemic response; common clinical features caused by intestinal impaired blood perfusion include bacterial translocation, systemic inflammatory response syndrome, acute lung injury, or multiple organ failure (2). Although intestinal ischemia and hypoxia result in hypoxia-induced inflammation (3, 4), hypoxia also drives hypoxia-associated anti-inflammatory responses, particularly through changes in gene expression coordinated by the transcription factor hypoxia-inducible factor (HIF)-1 (5–8). As an important regulator of oxygen homeostasis, HIF-1 has been implicated in transcriptional regulation of anti-inflammatory or tissue-protective–signaling pathways (6, 7, 9–11). For example, HIF-1 coordinates the production and signaling properties of extracellular adenosine (7, 9–11). Specifically, HIF-1α has been implicated in the coordinated induction of ecto-5′-nucleotidase (CD73)—the pacemaker enzyme of extracellular adenosine production (12–14)—and the A2B adenosine receptor (A2BAR) (13, 15). Moreover, CD73 and A2BAR have been implicated in intestinal protection from ischemia (16, 17) or inflammation (18, 19). Based on our previous studies showing protection from extracellular adenosine generation (20) and A2BAR signaling (16) in intestinal IR, we hypothesized that HIF represents a potential therapeutic target through its effects on CD73 and the A2BAR. Consistent with this hypothesis, we provide evidence for a protective role of hypoxia-dependent–signaling pathways during mucosal IR injury involving HIF-dependent enhancement of purinergic-signaling pathways. The animal protocols were approved by the Institutional Animal Care and Use Committee of the University Hospital, Regierungspräsidium Tübingen, and the University of Colorado Denver, and were in accordance with the National Institutes of Health guidelines for use of live animals. Studies included mice deficient in cd73 (cd73−/− mice) (12), A2BAR (A2BAR−/− mice) (Deltagen, San Carlos, CA) (21–23), HIF-1α (Hif1a2-lox/2-lox, referred to as HIF−/− mice) (10, 11, 24, 25), and littermate controls matched for age, gender, and weight. Fabpl4x at-132-Cre were used as HIF+/+ (wild-type [WT]) mice. All mice were placed on a temperature-controlled heating table with a rectal thermometer probe attached to a thermal-feedback controller to maintain body temperature at 37°C. Mice were anesthetized with isoflurane (The Multi-Station Research Anesthesia System, Harvard Apparatus, March-Hugstetten, Germany) or pentobarbital (50 mg/kg i.p.). After a midline laparotomy, intestinal ischemia was produced by clamping the superior mesenteric artery for 15 min, followed by unclamping for 3 h of reperfusion, as described previously (16, 20). Sham-operated controls underwent the same surgical procedure but without intestinal IR. Mice were treated with 5 mg dimethyloxallyl glycine (DMOG; Frontier Scientific, Logan, UT; 5 mg i.p., 4 h before ischemia), a prolyl-hydroxylase inhibitor that stabilizes HIF under normoxic conditions (4, 9, 26, 27), or 17-(dimethylaminoethylamino)-17-demethoxygeldanamycin (17-DMAG; LC Laboratories, Woburn, MA; 1 mg i.p., 4 h prior to ischemia), a potent HIF-1 inhibitor (28). To examine the influence of intestinal IR on transcript levels, C57BL/6 mice underwent intestinal ischemia followed by reperfusion. Mice were euthanized at the indicated time points, and mucosal scrapings were performed. Total RNA was isolated using the total RNA isolation NucleoSpin RNA II Kit, according to the manufacturer’s instructions (Macherey & Nagel, Dueren, Germany). cDNA synthesis was performed using reverse transcription, according to the manufacturer’s instructions (i-script Kit; Bio-Rad Laboratories, Munich, Germany). The primer sets for the PCR reaction contained 1 μM sense and 1 μM antisense with SYBR Green I (Molecular Probes, New Brunswick, NJ). Primer sequences for murine CD73 were (sense/antisense, respectively) 5′-CAAATCCCACACAACCACTG-3′ and 5′-TGCTCACTTGGTCACAGGAC-3′ and for A2BAR were 5′-GGA AGG ACT TCG TCT CTC CA-3′, 5′-GGG CAG CAA CTC AGA AAA CT-3′. Murine β-actin sense primer (5′-ACATTGGCATGGCTTTGTTT-3′) and antisense primer (5′-GTTTGCTCCAACCAACTGCT-3′) were used to control for the starting template. Levels and fold change in mRNA were determined as described previously (27). Protein extracts were solubilized and reduced. Samples were resolved on a 10% polyacrylamide gel and transferred to nitrocellulose membranes. The membranes were blocked in 5% nonfat dry milk (Applichem, Cheshire, CT) in TBST. The membranes were incubated with anti-CD73 rabbit polyclonal Ab raised against the C terminus (expected molecular mass, 63 kDa; Abgent, San Diego, CA); anti-A2BAR, an affinity-purified goat polyclonal Ab raised against a peptide mapping near the C terminus of the A2BAR of rat origin (expected molecular mass, 50–55 kDa; Santa Cruz Biotechnology, Danvers, MA); or HIF1α Ab (expected molecular mass, 120 kDa; BD Biosciences, San Jose, CA). Membranes were subsequently incubated with goat anti-rabbit HRP. Proteins were detected by ECL. To ensure equal loading, membranes were stripped and detected for β-actin and then incubated with goat anti-rabbit HRP. The wash was repeated, and proteins were detected by ECL (29–31). Aspartate aminotransferase (AST; Teco Diagnostics, Anaheim, CA) was measured using a microtiter plate adaptation of a commercially available kit or was measured in the clinical laboratory of the University Hospital at University of Colorado Denver. IL-6 and TNF-α were measured using a commercially available ELISA kit (R&D Systems, Minneapolis, MN) (16, 17, 20). To quantify neutrophil infiltration, we measured myeloperoxidase (MPO) using a mouse MPO ELISA kit (Hycult Biotech, Uden, The Netherlands). Mice were euthanized at the indicated time points; intestine was removed; and tissues were fixed in 4.5% buffered formalin, dehydrated, and embedded in paraffin. Sections (3 μm) were stained with H&E, and the extent of mucosal damage was quantified, as described previously using this model (23), using a semiquantitative grading system adapted from Chiu et al. (32). Injury was classified using the following 5-point scale, in which a numerical score was assigned based on the degree of mucosal and submucosal damage: 0 = normal; 1 = development of apical subepithelial space; 2–3 = epithelial lifting; 4 = cellular infiltration; and 5 = disintegration of lamina propria, hemorrhage, and ulceration. All data are presented as mean ± SEM and were analyzed using ANOVA, followed by post hoc Bonferroni multiple comparison test. Intestinal injury was analyzed with the Kruskal–Wallis test, with follow-up pairwise comparisons by the Wilcoxon–Mann–Whitney U test. Previous studies indicated that HIF-dependent induction of CD73 is critical in attenuating hypoxia-driven vascular leakage or inflammation (33). To determine whether the observed gut protection from IR involves CD73, we first investigated intestinal CD73 expression following DMOG treatment in the setting of intestinal IR. DMOG is a pan-prolyl-hydroxylase inhibitor that is associated with robust HIF stabilization and induction of HIF-dependent genes (9, 34–36). After DMOG treatment, we harvested intestinal epithelial scrapings and measured CD73 transcript levels via real-time RT-PCR and CD73 protein via Western blotting. These studies revealed a significant induction of CD73 transcript (Fig. 1A) and protein levels (Fig. 1B, 1C) in mice pretreated with DMOG and subsequently exposed to 15 min of ischemia and 3 h of reperfusion, compared with vehicle-treated mice exposed to IR. As a negative control, a Western blot from cd73−/− mice is also shown (Fig. 1B, 1C). These data indicated that pharmacological HIF stabilization is associated with enhanced CD73 transcript and protein levels during intestinal IR. DMOG treatment induces CD73 mRNA and protein during IR. A, WT mice were pretreated or not with DMOG (5 mg i.p., 4 h prior to ischemia), followed by 15 min of ischemia and 3 h of reperfusion. CD73 transcript levels were studied in mucosal scrapings by real-time RT-PCR, calculated relative to housekeeping gene β-actin, and are expressed as the mean ± SEM of three mice/group. 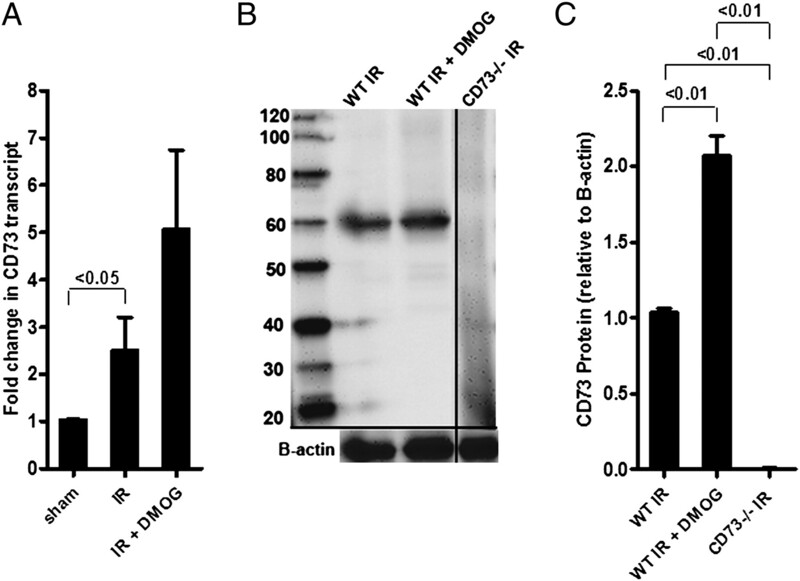 B, Western blot from intestinal epithelial scrapings of WT and cd73−/− mice under similar conditions. Membranes were probed with anti-CD73 Ab. One representative of three blots is shown. The same blot was reprobed for β-actin as a control for protein loading. C, CD73 protein was calculated by densitometry relative to β-actin (n = 3). Based on our findings demonstrating that DMOG treatment results in transcriptional induction of CD73 during intestinal IR, we next investigated whether the protective effects of pharmacological HIF-1 activation during IR are functionally related to CD73. For this purpose, we carried out studies of intestinal IR injury in previously described mice gene-targeted for cd73 (12). We found that gut protection with DMOG pretreatment was abolished in cd73−/− mice. Although DMOG pretreatment attenuated AST, IL-6, TNF, and MPO levels in WT mice, DMOG treatment was ineffective in cd73−/− mice (Fig. 2A–D). Furthermore, DMOG treatment had no effect on basal levels of these parameters (WT sham + DMOG). We also examined jejunum from WT or cd73−/− mice treated or not with DMOG. As we showed previously (20), intestinal IR resulted in loss and shortening of intestinal villi and marked intestinal epithelial cell denudation in WT and cd73−/− mice compared with sham controls (Fig. 2E). Although DMOG pretreatment attenuated histological injury in WT mice, injury was not abolished in cd73−/− mice. Thus, semiquantitative histological analysis of these sections demonstrated a significant decrease in the Chiu index (32) in WT mice that underwent IR after treatment with DMOG compared with untreated mice, whereas there was no decrease in cd73−/− mice that underwent IR after treatment with DMOG compared with untreated cd73−/− mice (Fig. 2E, 2F). Taken together, these data indicated that CD73 represents a critical component of DMOG-dependent gut protection from IR. DMOG protection from IR is abolished in cd73−/− mice. Cd73−/− mice or littermate controls were pretreated with DMOG (5 mg i.p., 4 h prior to ischemia) or vehicle, followed by subjection to 15 min of ischemia and 3 h of reperfusion. Injury was measured for AST (A), IL-6 (B), TNF (C), and MPO (D). Results are expressed as the mean ± SEM of four to eight mice per group. E, H&E staining of jejunum sections (original magnification ×200). F, Quantification of ischemic injury. Results are expressed as median ± range (n = 3 mice/group). Extracellular adenosine produced by CD73 can signal through four adenosine receptors. Previous studies indicated a concomitant induction of CD73 and A2BAR during ambient hypoxia, both transcriptionally regulated by HIF-1, as well as functional involvement in attenuating hypoxia- or ischemia-driven inflammation (33). Moreover, we previously demonstrated that A2BAR signaling protects against acute intestinal IR injury (16). Therefore, we hypothesized that DMOG-dependent gut protection involves A2BAR as the signaling end point. Along these lines, we investigated intestinal A2BAR expression during intestinal IR following DMOG or vehicle treatment. These studies revealed a significant induction of A2BAR transcript (Fig. 3A) and protein levels (Fig. 3B, 3C) in mice pretreated with DMOG and subsequently exposed to 15 min of ischemia and 3 h of reperfusion compared with vehicle-treated mice. As a negative control, a Western blot from A2BAR−/− mice is also shown (Fig. 3B, 3C). Taken together, these data indicated induction of A2BAR transcript and protein following intestinal IR with pharmacological HIF-1 activation. DMOG treatment induces A2BAR transcript and protein levels during IR. A, WT mice were pretreated or not with DMOG (5 mg i.p., 4 h prior to ischemia), followed by 15 min of ischemia and 3 h of reperfusion. A2BAR transcript levels were studied in mucosal scrapings by real-time RT-PCR and calculated relative to housekeeping gene β-actin; they are expressed as the mean ± SEM of three mice/group. 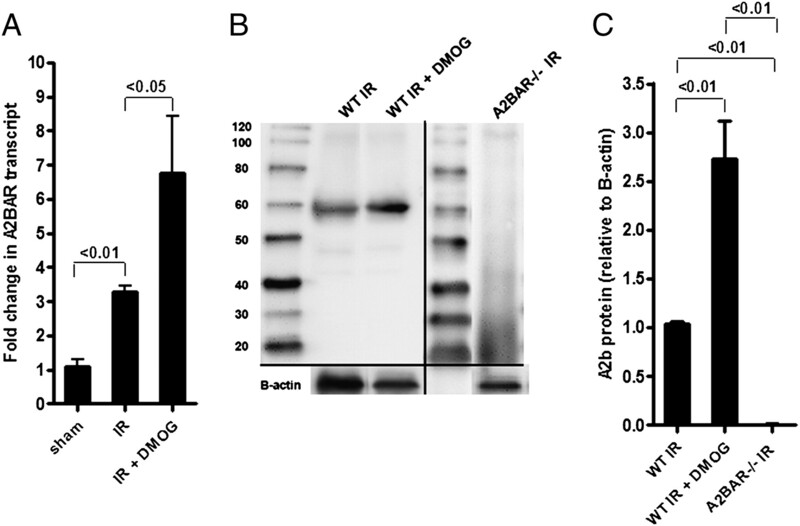 B, Western blot from intestinal epithelial scrapings of WT and A2BAR−/− mice under similar conditions. Membranes were probed with anti-A2BAR Ab. One representative of three blots is shown. The same blot was reprobed for β-actin as a control for protein loading. C, A2BAR protein was calculated by densitometry relative to β-actin (n = 3). Based on our findings demonstrating that DMOG treatment results in transcriptional induction of A2BAR during intestinal IR, we next investigated whether the protective effects of pharmacological HIF-1 activation during IR require the presence of A2BAR as the signaling end point. For this purpose, we carried out studies of intestinal IR injury in previously described mice gene-targeted for A2BAR (22). Consistent with our hypothesis that adenosine signaling through A2BAR is critical for DMOG-dependent gut protection during IR, we found that DMOG pretreatment was ineffective in A2BAR−/− mice. Although DMOG pretreatment attenuated AST, IL-6, TNF, and MPO levels in WT mice, such responses were abolished in mice with targeted gene deletion of A2BAR (Fig. 4A–D). DMOG treatment had no effect on basal levels of these parameters (WT sham + DMOG). 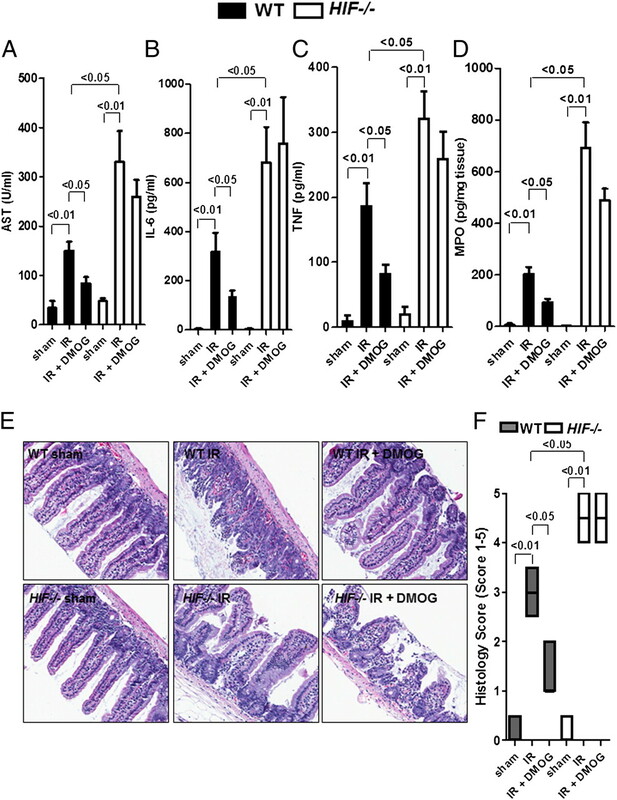 Histological analysis revealed that intestinal IR resulted in loss and shortening of intestinal villi and marked intestinal epithelial cell denudation in WT and A2BAR−/− mice compared with sham controls (Fig. 4E). Histological analysis also showed that although DMOG treatment prior to IR significantly attenuated histological injury in WT mice, it was not decreased in A2BAR−/− mice (Fig. 4E, 4F). Taken together, these data indicated that A2BAR is important as an end point-signaling event in DMOG-dependent gut protection from IR injury. DMOG protection is abolished in A2BAR−/− mice. A2BAR−/− mice or littermate controls were pretreated with DMOG (5 mg i.p., 4 h prior to ischemia) or vehicle, followed by 15 min of ischemia and 3 h of reperfusion. Injury was measured for AST (A), IL-6 (B), TNF (C), and MPO (D). Results are expressed as the mean ± SEM of four to eight mice per group. E, H&E staining of jejunum sections (original magnification ×200). F, Quantification of ischemic injury. Results are expressed as median ± range (n = 3 mice/group). As proof of principle and to further demonstrate that HIF-1 regulates intestinal IR injury, we next investigated the role of HIF-1 in protection against intestinal IR in previously described mice with conditional deletion of HIF-1α in the intestinal epithelium (HIF−/−) (24). Following intestinal IR, HIF−/− mice demonstrated significantly higher levels of AST, IL-6, TNF, and MPO compared with WT mice (Fig. 5A–D). Furthermore, we demonstrated that the protective effects of DMOG against reperfusion injury are lost in conditional HIF−/− mice. 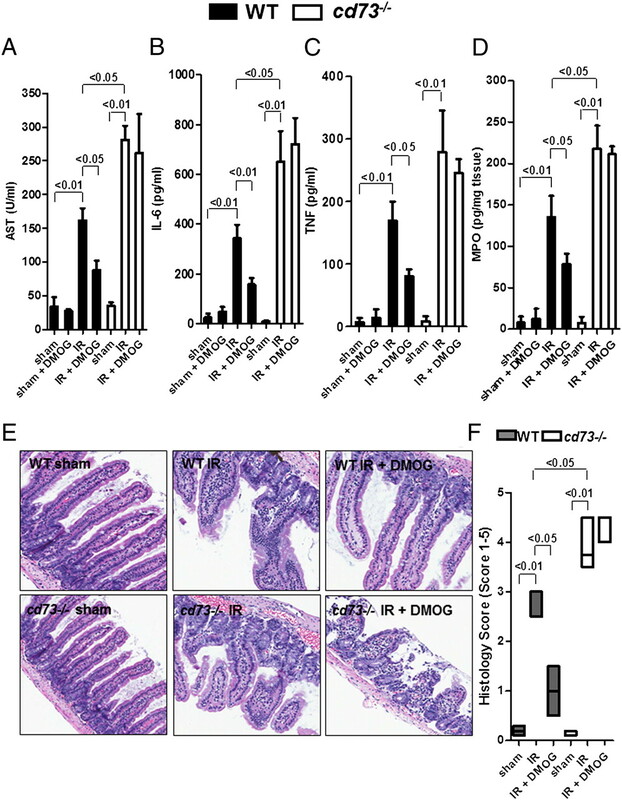 Additionally, histology of the jejunum showed that intestinal IR resulted in loss and shortening of intestinal villi and noticeable intestinal epithelial cell denudation in WT and HIF−/− mice compared with sham controls (Fig. 5E). Histological analysis confirmed that DMOG treatment was associated with reconstitution of a WT sham phenotype in WT mice but not in HIF−/− mice (Fig. 5E, 5F). These data provided genetic evidence for a protective role of HIF-1α expressed in intestinal epithelial cells during intestinal IR. DMOG protection is abolished in mice with conditional deletion of HIF in intestinal epithelia. Mice with conditional deletion of HIF-1α in intestinal epithelia (HIF−/−) or littermate controls (WT) were pretreated with DMOG (5 mg i.p., 4 h prior to ischemia) or vehicle, followed by 15 min of ischemia and 3 h of reperfusion. Injury was measured for AST (A), IL-6 (B), TNF (C), and MPO (D). All results are expressed as the mean ± SEM of four to eight mice/group. E, H&E staining of jejunum sections (original magnification ×200). F, Quantification of ischemic injury. Results are expressed as median ± range (n = 3 mice/group). To confirm that HIF is stabilized in DMOG-treated animals, we harvested intestine and measured HIF-1α protein via Western blotting. 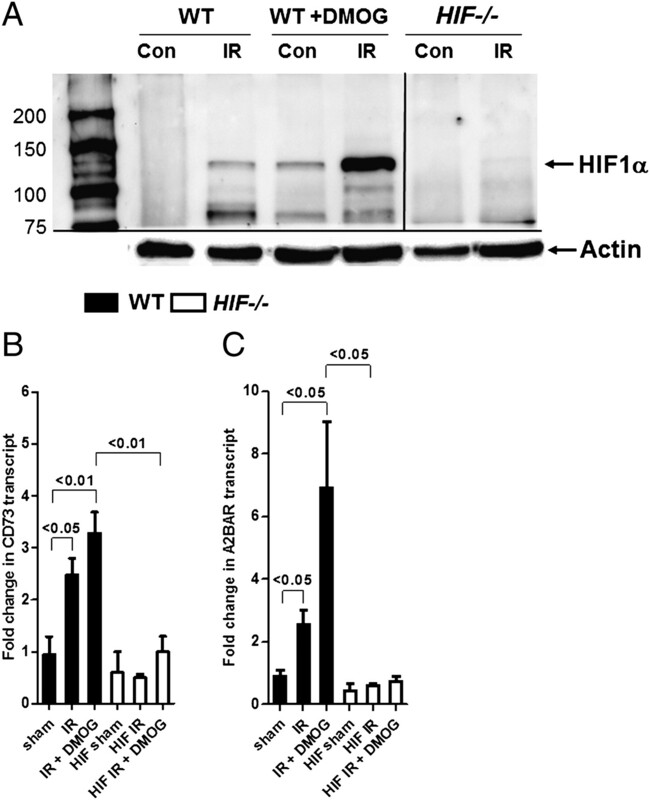 IR alone increased HIF-1α protein levels in WT mice but not in mice with conditional deletion of HIF-1α in the intestinal epithelium (Fig. 6A). Following IR, HIF-1α protein levels were substantially increased in WT mice after DMOG treatment compared with untreated WT mice, confirming the use of DMOG in the induction of HIF. Next, we harvested intestinal epithelial scrapings from WT mice or mice with conditional deletion of HIF-1α in the intestinal epithelium that were treated or not with DMOG following IR. Following intestinal IR, CD73 and A2BAR transcript levels were significantly increased in WT mice but not in HIF−/− mice (Fig. 6B, 6C, respectively). Furthermore, we demonstrated that DMOG pretreatment additionally increased CD73 and A2BAR transcript levels in WT mice compared with WT mice that underwent IR alone, but it was ineffective in HIF−/− mice. Collectively, our results showed that DMOG targets its effects on CD73 and A2BAR via HIF in the intestine. DMOG treatment induces HIF, CD73, and A2BAR in WT mice but not in mice with conditional deletion of HIF in intestinal epithelia during IR. Mice with conditional deletion of HIF-1α in intestinal epithelia (HIF−/−) or littermate controls (WT) were pretreated or not with DMOG (5 mg i.p., 4 h prior to ischemia), followed by 15 min of ischemia and 3 h of reperfusion. A, Western blot from intestinal epithelial scrapings of WT and HIF−/− mice. Membranes were probed with anti–HIF-1 Ab. One representative of three blots is shown. The same blot was reprobed for β-actin as a control for protein loading. CD73 (B) and A2BAR (C) transcript levels were studied under similar conditions in mucosal scrapings by real-time RT-PCR and calculated relative to housekeeping gene β-actin; they are expressed as the mean ± SEM of three mice/group. To confirm the functional role of HIF-1, we performed pharmacological studies in WT mice subjected to intestinal IR following treatment with 17-DMAG, a strong HIF-1 inhibitor (28, 37). Following intestinal IR, 17-DMAG–treated mice demonstrated significantly higher levels of AST, IL-6, TNF, and MPO compared with vehicle-treated mice (Fig. 7). Furthermore, 17-DMAG treatment had no effect on the basal levels of these parameters (sham + 17-DMAG). Taken together, these studies provided additional pharmacological evidence of HIF-mediated tissue protection during intestinal IR. Inhibition of HIF with 17-DMAG increased injury in WT mice. WT mice were pretreated with 17-DMAG (1 mg i.p., 4 h prior to ischemia) or vehicle, followed by 15 min of ischemia and 3 h of reperfusion. Injury was measured for AST (A), IL-6 (B), TNF (C), and MPO (D). Results are expressed as the mean ± SEM of four mice/group. We previously showed that CD73 and A2BAR are important protective mediators against acute mesenteric IR injury via activation of the adenosine pathway (16, 20). The present study extended these findings and demonstrated that HIF-1α is a key regulatory element of this pathway during intestinal IR. Specifically, we showed that pharmacological stabilization of HIF-1 induces CD73 and A2BAR in intestinal epithelial cells. We also demonstrated that HIF-1 activation is protective in WT mice but not inCD73−/−, A2BAR−/−, or HIF−/− mice. Moreover, we showed that deficiency of HIF-1α in intestinal epithelia or pharmacological inhibition of HIF is associated with increased intestinal IR injury. Taken together, these studies indicated a protective role for HIF-1 during intestinal IR injury, involving extracellular pathways of adenosine generation and signaling. In the current study, we demonstrated that DMOG treatment prior to intestinal IR induced HIF, CD73, and A2BAR in WT mice but not in conditional intestinal HIF−/− mice. Although we did not measure other transcriptional pathways, in agreement with the present results, multiple lines of evidence implicate hypoxia-dependent–signaling pathways in the metabolism of adenine nucleotides to adenosine (9–11, 13, 14, 25, 38, 39), as well as amplification of adenosine receptor-signaling events during limited oxygen availability (6, 7, 15, 40). As such, we previously demonstrated a central role for CD73, the key enzyme in extracellular adenosine production, in attenuating intestinal IR-mediated injury (20). CD73 is induced by ambient exposure to hypoxia (14, 24) or following mesenteric ischemia (20). Moreover, HIF was suggested to enhance adenosine-signaling events on the receptor level (15, 40). Similarly, adenosine-clearance mechanisms, such as those involving equilibrative nucleoside transporters, are repressed during hypoxia through HIF-1–dependent mechanisms, thereby lengthening the apparent half-life of extracellular adenosine (10, 25). Equilibrative nucleoside transporters were shown to be present in murine and human intestine (25, 38). We also previously demonstrated that A2BAR signaling provides potent protection during intestinal IR (16); in the current study, we extended these findings and showed that A2BAR is an important signaling end point in HIF-dependent gut protection. Genetic studies to address the role of HIF-1 in human diseases are complicated by the fact that genetic deletion of HIF-1α results in embryonic lethality (41, 42). Therefore, Karhausen et al. (24) generated a mouse line with intestinal epithelium-targeted deletion of HIF-1α. Similar to the present findings of HIF-1–dependent protection from intestinal IR injury, studies of murine colitis in conditional HIF-1α−/− mice revealed that decreased HIF-1 expression correlated with more severe clinical symptoms (mortality, weight loss, colon length). Two recent independent studies tested different pharmacological strategies of HIF-1 activators; both found a protective role for HIF-1 in murine colitis (26, 43). Taken together, these studies identify HIF-1 as a critical factor for attenuating mucosal inflammation during experimental intestinal ischemia. Collectively, our results contribute to the current understanding of adenosine signaling via HIF regulation in intestinal ischemia and hypoxia. Given the importance of HIF-α as a mediator of adaptation to low oxygen levels, pharmacological strategies to stabilize HIF under conditions of intestinal ischemia or inflammation may represent a novel therapeutic approach to treat mesenteric IR injury. Present challenges involve the translation of these findings from the research laboratory to a clinical setting, as well studying the potential side effects of HIF activators [e.g., on platelet function (44), blood pressure and heart rate (45), or alteration of erythropoiesis or tumor growth (36)]. We thank Stephanie Zug, Stephanie Laucher, and David Köhler, Department of Anesthesiology, University of Tübingen, and Douglas Ridyard, Department of Anesthesiology, University of Colorado Denver, for technical assistance. In addition, we thank Dr. Linda F. Thompson, Oklahoma Medical Research Foundation, for generously providing gene-targeted mice for cd73 and for critically reading the manuscript. This work was supported by University of Tübingen Fortune Grant F1211269 (to M.L.H. and H.K.E. ), European Society of Anaesthesiology Grant D3008762 (to M.L.H. and H.K.E. ), Foundation for Anesthesia Research and Education (to J.H.D. ), Deutsche Forschungsgemeinschaft Research Fellowship GR2121/1–1 (to A.G.), National Institutes of Health Grants R01-HL092188, R01-DK083385, and R01-HL098294 (to H.K.E. ), and the Foundation for Anesthesia Education and Research (to H.K.E.). 2003. Acute intestinal ischemia and infarction. Semin. Gastrointest. Dis. 14: 66–76.
. 2004. Ischemia-reperfusion injury of the intestine and protective strategies against injury. Dig. Dis. Sci. 49: 1359–1377.
. 2006. Prolyl hydroxylase-1 negatively regulates IkappaB kinase-beta, giving insight into hypoxia-induced NFkappaB activity. Proc. Natl. Acad. Sci. USA 103: 18154–18159. 2008. Interdependent roles for hypoxia inducible factor and nuclear factor-kappaB in hypoxic inflammation. J. Physiol. 586: 4055–4059.
. 2001. Role of G-protein-coupled adenosine receptors in downregulation of inflammation and protection from tissue damage. Nature 414: 916–920.
. 2005. Regulation of immune cells by local-tissue oxygen tension: HIF1 alpha and adenosine receptors. Nat. Rev. Immunol. 5: 712–721.
. 2004. Physiological control of immune response and inflammatory tissue damage by hypoxia-inducible factors and adenosine A2A receptors. Annu. Rev. Immunol. 22: 657–682.
. 2005. Oxygenation inhibits the physiological tissue-protecting mechanism and thereby exacerbates acute inflammatory lung injury. PLoS Biol. 3: e174.
. 2008. Hypoxia-inducible factor-1 is central to cardioprotection: a new paradigm for ischemic preconditioning. Circulation 118: 166–175.
. 2005. HIF-1-dependent repression of equilibrative nucleoside transporter (ENT) in hypoxia. J. Exp. Med. 202: 1493–1505.
. 2008. HIF-1-dependent repression of adenosine kinase attenuates hypoxia-induced vascular leak. Blood 111: 5571–5580.
. 2004. Crucial role for ecto-5′-nucleotidase (CD73) in vascular leakage during hypoxia. J. Exp. Med. 200: 1395–1405.
. 2003. Coordinated adenine nucleotide phosphohydrolysis and nucleoside signaling in posthypoxic endothelium: role of ectonucleotidases and adenosine A2B receptors. J. Exp. Med. 198: 783–796.
. 2002. Ecto-5′-nucleotidase (CD73) regulation by hypoxia-inducible factor-1 mediates permeability changes in intestinal epithelia. J. Clin. Invest. 110: 993–1002.
. 2006. HIF-dependent induction of adenosine A2B receptor in hypoxia. FASEB J. 20: 2242–2250.
. 2009. 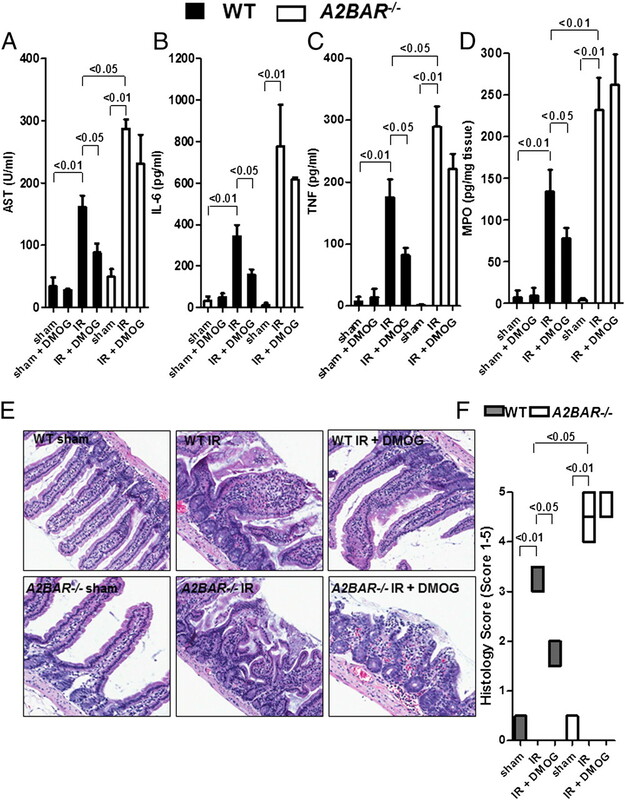 Cutting Edge: A2B Adenosine receptor signaling provides potent protection during intestinal ischemia/reperfusion injury. J. Immunol. 182: 3965–3968.
. 2008. Extracellular adenosine production by ecto-5′-nucleotidase protects during murine hepatic ischemic preconditioning. Gastroenterology 135: 1739–1750.e3.
. 2008. Control of IFN-alphaA by CD73: implications for mucosal inflammation. J. Immunol. 180: 4246–4255.
. 2009. Contribution of adenosine A2B receptors to inflammatory parameters of experimental colitis. J. Immunol. 182: 4957–4964.
. 2008. Role of extracellular nucleotide phosphohydrolysis in intestinal ischemia-reperfusion injury. FASEB J. 22: 2784–2797.
. 2008. The reno-vascular A2B adenosine receptor protects the kidney from ischemia. PLoS Med. 5: e137.
. 2008. A2B adenosine receptor signaling attenuates acute lung injury by enhancing alveolar fluid clearance in mice. J. Clin. Invest. 118: 3301–3315.
. 2007. Cardioprotection by ecto-5′-nucleotidase (CD73) and A2B adenosine receptors. Circulation 115: 1581–1590.
. 2004. Epithelial hypoxia-inducible factor-1 is protective in murine experimental colitis. J. Clin. Invest. 114: 1098–1106.
. 2009. Hypoxia-inducible factor-dependent repression of equilibrative nucleoside transporter 2 attenuates mucosal inflammation during intestinal hypoxia. Gastroenterology 136: 607–618.
. 2008. The hydroxylase inhibitor dimethyloxalylglycine is protective in a murine model of colitis. Gastroenterology 134: 156–165.
. 2007. Hypoxia and gastrointestinal disease. J. Mol. Med. 85: 1295–1300.
. 2007. Targeting heat shock protein 90 in pancreatic cancer impairs insulin-like growth factor-I receptor signaling, disrupts an interleukin-6/signal-transducer and activator of transcription 3/hypoxia-inducible factor-1alpha autocrine loop, and reduces orthotopic tumor growth. Clin. Cancer Res. 13: 6459–6468.
. 2008. 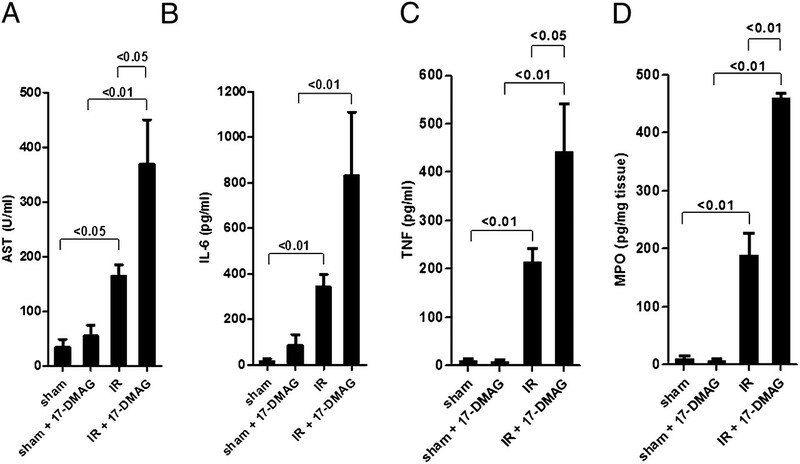 Oxygen-independent stabilization of hypoxia inducible factor (HIF)-1 during RSV infection. PLoS ONE 3: e3352.
. 2007. Hypoxia inducible factor (HIF)-1 coordinates induction of Toll-like receptors TLR2 and TLR6 during hypoxia. PLoS ONE 2: e1364.
. 2008. ATP release from vascular endothelia occurs across Cx43 hemichannels and is attenuated during hypoxia. PLoS ONE 3: e2801. 1970. Intestinal mucosal lesion in low-flow states. I. A morphological, hemodynamic, and metabolic reappraisal. Arch. Surg. 101: 478–483. 2009. Adenosine: an old drug newly discovered. Anesthesiology 111: 904–915.
. 2009. Oxygen sensors at the crossroad of metabolism. Cell Metab. 9: 11–22.
. 2009. Hypoxia-inducible factor-dependent induction of netrin-1 dampens inflammation caused by hypoxia. Nat. Immunol. 10: 195–202.
. 2009. Inhibition of oxygen sensors as a therapeutic strategy for ischaemic and inflammatory disease. Nat. Rev. Drug Discov. 8: 139–152.
. 2010. Activation of hypoxia inducible factor 1 is a general phenomenon in infections with human pathogens. PLoS ONE 5: e11576.
. 2007. Physiological roles of vascular nucleoside transporters. Arterioscler. Thromb. Vasc. Biol. 27: 1004–1013.
. 2004. Endogenous adenosine produced during hypoxia attenuates neutrophil accumulation: coordination by extracellular nucleotide metabolism. Blood 104: 3986–3992.
. 2009. Adenosine A2A receptor is a unique angiogenic target of HIF-2alpha in pulmonary endothelial cells. Proc. Natl. Acad. Sci. USA 106: 10684–10689.
. 1998. HIF-1 alpha is required for solid tumor formation and embryonic vascularization. EMBO J. 17: 3005–3015.
. 1998. Role of HIF-1alpha in hypoxia-mediated apoptosis, cell proliferation and tumour angiogenesis. [Published erratum appears in 1998 Nature 395: 525.] Nature 394: 485–490.
. 2008. Mucosal protection by hypoxia-inducible factor prolyl hydroxylase inhibition. Gastroenterology 134: 145–155.
. 2008. Direct treatment of mouse or human blood with soluble 5′-nucleotidase inhibits platelet aggregation. Arterioscler. Thromb. Vasc. Biol. 28: 1477–1483.
. 2009. Selective deletion of the A1 adenosine receptor abolishes heart-rate slowing effects of intravascular adenosine in vivo. PLoS ONE 4: e6784.